Tamil Nadu is the third biggest State in terms of number of subscribers under the Centre’s Atal Pension Yojana. The State has over 6 lakh subscribers, after Uttar Pradesh (about 11.27 lakh) and Bihar (over 8 lakh subscribers) under the scheme which is mainly targeted at workers from the unorganised sector, according to data from the Pension Fund Regulatory and Development Authority (PFRDA), which oversees the scheme. “Our experience in Tamil Nadu has been good and thousands of accounts have been opened under the Atal Pension Yojana scheme,” Hemant Contractor, chairman, PFRDA, told The Hindu. 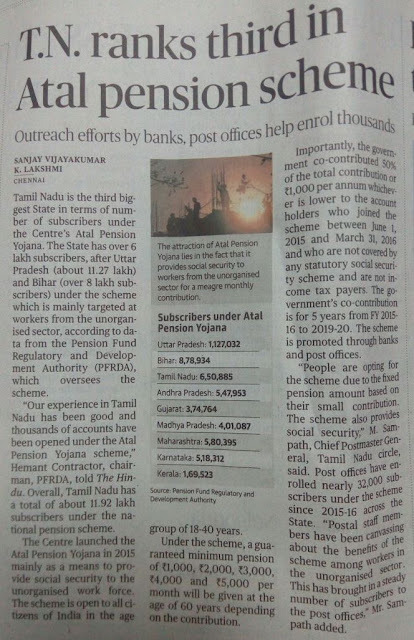 Overall, Tamil Nadu has a total of about 11.92 lakh subscribers under the national pension scheme. The Centre launched the Atal Pension Yojana in 2015 mainly as a means to provide social security to the unorganised work force. The scheme is open to all citizens of India in the age group of 18-40 years. Under the scheme, a guaranteed minimum pension of ₹1,000, ₹2,000, ₹3,000, ₹4,000 and ₹5,000 per month will be given at the age of 60 years depending on the contribution. Importantly, the government co-contributed 50% of the total contribution or ₹1,000 per annum whichever is lower to the account holders who joined the scheme between June 1, 2015 and March 31, 2016 and who are not covered by any statutory social security scheme and are not income tax payers. The government’s co-contribution is for 5 years from FY 2015-16 to 2019-20. The scheme is promoted through banks and post offices. “People are opting for the scheme due to the fixed pension amount based on their small contribution. The scheme also provides social security,” M. Sampath, Chief Postmaster General, Tamil Nadu circle, said. Post offices have enrolled nearly 32,000 subscribers under the scheme since 2015-16 across the State. “Postal staff members have been canvassing about the benefits of the scheme among workers in the unorganised sector. This has brought in a steady number of subscribers to the post offices,” Mr. Sampath added.